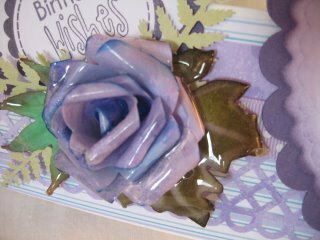 Try this Enamelled Rose Tutorial for spectacular results to paper flowers. 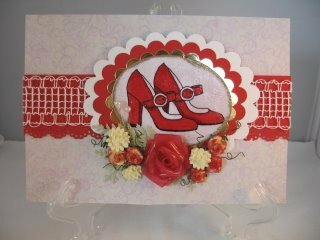 It will turn them into something truly special to add to any of your projects and you don't need to stop at roses. Make them in other sizes too and group them together on anything you are altering. This beautiful flower looks just like glass, and it dries quite hard once the effect is cool. 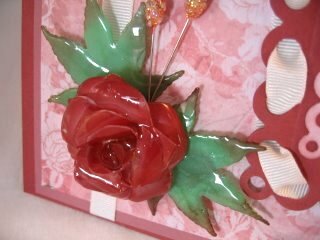 For the Written Instructions to make the Paper Roses. Both pages will give you the steps to make the flowers, and the different ways you can make them really pretty. This next technique that I am sharing with you takes these flowers to another level altogether and it will please you immensely. The foil dishes are quite cheap to buy and if you take a look in the "Pound Shop" you can buy a pack of maybe 10 for your £1. Don't drop it on either the work surface or your skin. But don't be afraid to try it ....just take care. Probably not a good one for the kids to do by them selves. Make your flowers in different colours and store them safely until you are ready to use them, and if you bend the petals once they are cool the glaze will crack. Once you are done making them don't throw away the cooled solution.